A big thank you to Zorena for capturing what he could before he died. Is it cheap? – New players don’t have big wallets, and you’re not spending more than 40mill for a T1 cruiser here. Does it work when you have a ton of dudes? – You NEED a ton of dudes to make this fleet work properly, hitting critical mass at around 30-40 in fleet. Does it provide opportunities to learn about core game mechanics for both newer and more experienced players? – When you have a corporation of lots of people of low SP, a large part of your fights are going to be brawling blobs when you land at zero, shoot the primary and press F1. In this fleet you learn about managing range, different ammo types and fleet basics in the Caracal, logistics basics in the Scythe, interesting EWAR in the Celestis where you have a sufficient drone bay that you have to pay attention to what you should be doing with those, and independent target prioritisation in the Bellicose, while painting the main DD primary. By having backup anchors for DD and Logistics, I can also help train new FCs who want a bit of a stepping stone from F1 monkey to doing everything. Both Interceptors and Interdictors are exceptionally useful in this fleet, and have the potential to make interesting piloting as the core ships do not have tackling modules. We had taken longer than usual to form up as it was a brand new Doctrine and a brand new way of flying for the UNI, but we set off in reasonably good time where we came upon a medium-sized no-holds-barred armour setup travelling though low sec. None of them were engageable under the UNIs RoE so we followed them for a little while to see if they were going anywhere interesting, but sadly they headed straight for Hi Sec. Not a lot happened as we looped around back onto my original course, but eventuually we made it to one of my favourite places to find a big fight at the moment, the CVA/AAA border. If we had found nothing there then I would have taken us no fear mode into Curse where pretty much everyone in the game is deployed at the moment, but thankfully CVA obliged us to a fight. We found a few Drakes and a Sabre on our outgate in 4B-NQN, and our scout reported the rest of them on the other side. The odds were not in our favour, especially with all that light tackle to web us down but I took us straight in as CVA sometimes lose their bottle and run if you look like you know what they have but are willing to engage them anyway. I made the choice I believed was best with the information I have at the time, and started to work through their tackle, despite the fact we would not be applying full damage to them. Had our Logi anchor not gotten webbed to smithereens off the bat, or handed over the role earlier, we may have survived a little longer to continue my plan of remove tackle, alpha Scythes, then move onto Drakes as we danced on the edge of their damage projection capabilities (same weapons, but Caracals have a hull bonus to missile velocity whereas Drakes do not). To be honest, we were going to welp hard even if that didn’t happen, and I knew that going in, but that was one hell of a lot of fun and a great introduction of the fleet concept to my UNIbros. 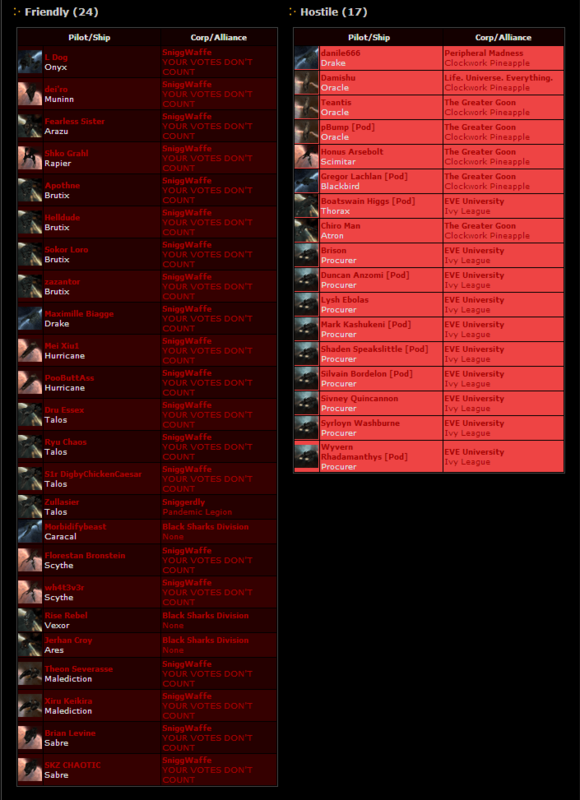 The ISK ration is 1:2 in their favour, but I like to think both sides had an awesome time and would have that fight again without hesitation. This entry was posted in E-UNI, Video on October 6, 2013 by Apoth. So I ran another “Starting out as a FC Q&A” for EVE UNI. I was a bit unwell so it was fairly informal and relaxed, but I had some good fun and it was nice to chat with some old friends in there. Thanks to Chloe C Connor of EVE University for doing the recording, as well as EVE University itself for having me. This entry was posted in E-UNI, Education on June 27, 2013 by Apoth. Or at least, doing everything reasonably possible to be aware of your surroundings and achieve your goals without losing your ship unnecessarily. Let’s talk about Concordless space, specifically anywhere not high-sec. Much of what I mention here will also apply to high-sec, but CONCORD does add a nice safety blanket in 0.5+ which I’m not going to take into account here. They were out in Syndicate which is very near to where Waffles are deployed, so naturally we went to say hi. Now, the plan was that we had a cloaky Hictor logged off in their mining system, we would warp him in, he’d bubble up and cyno us so we could bridge in off a borrowed Titan, then we could get some bear killmails and have a brawl with the defense fleet. At worst, the miners would be playing intelligently and we’d get a fight out of the defense fleet, which is pretty much all we wanted anyway. This was my first time doing an Op where we were a) shooting non-combat ships and b) bridging in off of a Titan. Watching the recording now makes me realise how chill and clinical the whole thing was, like giving the baby Unistas a ganking vaccine. A little pain now so (hopefully) they learn how to avoid the same thing happening in the future. Despite the nefariousness and a fair bit of butthurt that occurred afterwards, all of them could have avoided losing their barges through basic safety tips everyone should know, any one of these could have saved them. If you are insistent upon gnawing on those tasty Null asteroids, make bookmarks or use celestials at opposite ends of each belt such that you can align down the belt, do a pass of mining, then realign back and continue mining. This way the second anything appears in local or on D-Scan you can immediately warp to a safer spot, and even dock up until the danger has passed. If you are in null-sec and there are people in local who are not blue to you they WILL be trying to kill you, or relaying information about you to other people who will do it for them. If you’re mining ~dangerzone~, anything that can bubble you to prevent your prealigned escape will be either warping in decloaked or be cynoed in on top of you. Purely by paying attention to D-Scan the miners could have noticed an Onyx in space (even noticing it warping in their direction if they had multiple people scanning at different ranges). EZA-FM is a well travelled system in a region (Syndicate) historically known for multiple PvP-based entities living there and in general lots of fights happening, EZA-FM itself is in the middle of a web of systems, it has 4 adjacent systems which themselves have many adjacent systems of their own. If you must mine, do it in a lesser-travelled back-pocket with limited ingress and egress so you can take advantage of picket scouts (throwing an alt into a system on a gate where you can watch local and keep track of travel. 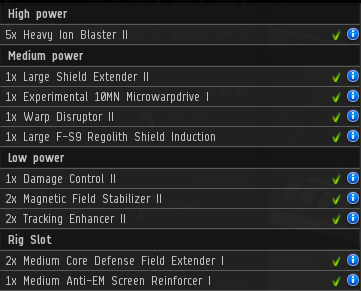 I am ashamed to say that I have Exhumers 5 on my character from my life before I joined EVE University and SniggWaffe, so I can appreciate the sadness, but by not taking any of the above precautions, as well mining in such a well-traveled system I’m afraid I have little sympathy for the UNIbros who lost their vessels. Just because you’re in PvP ships and have a trap planned does not mean you are prepared appropriately. On our way back home our +1 reported a gatecamp on the ingate in K5-, where there was a SFI and a few other bits and bobs sat in an anchored bubble. The most important part of this was that the system we were in, that any potential targets they would be shooting at would come from, was empty. i.e they had no scouts telling them what was going to jump on top of them. I warped our whole fleet to the gate and told our Drake to jump through. Yes, the most obvious bait in the world, but bear with me. Probably rather pleased with themselves, they decloaked multiple bombers and started torping our drake, so we just jumped everyone else in and started blapping. Sadly the lock times on BCs aren’t that great and they were all on the edge of the bubble, but thanks to our own bubbles we managed to snag a few kills. Guys, seriously. Gatecamping 101. Hell, EVE 101: Know what’s on the other side of the gate. 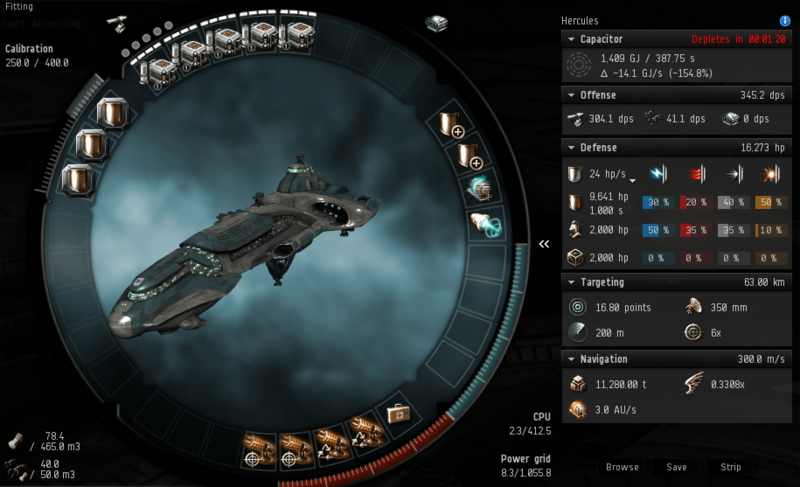 In summary, the way to stay reasonably safe in EVE and not lose your ship unnecessarily is to have a good awareness of your surroundings and be able to asses threats. Both of these things become vastly easier with experience, but they are critical ideas for any pilot or organisation nonetheless. By performing a few basic safety measures you can save yourself a lot of time and ISK. This entry was posted in E-UNI, Education, Filthy Piracy on June 17, 2013 by Apoth.